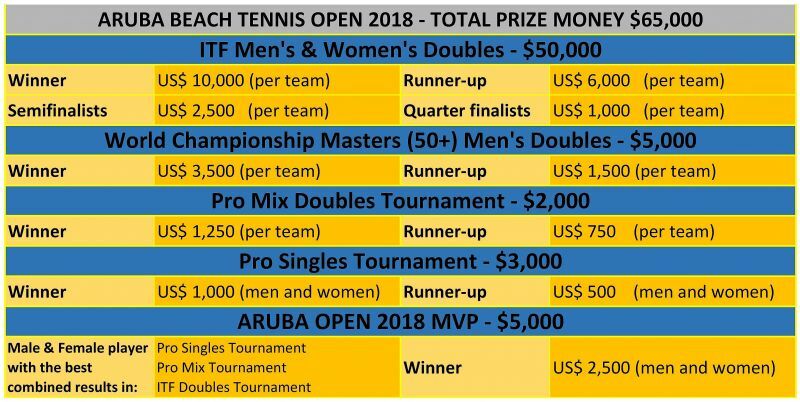 The ITF men's and women's doubles will collect a total of $50,000, the winners and runners up of the men's and women's singles tournament will divide $3,000, $2,000 will go to the mix doubles event. New is thies years World Cup Master Men's Doubles event with a total prize money of $5,000. The remaining $5,000 will be for the male and female Aruba Open 2018 MVP. To become Aruba Open 2018 MVP you will have to participate in the Pro Singles, the Pro Mix and the ITF doubles event. The player with the best combined result in these three tournaments will be crowned Aruba Open 2018 Most Valuable Player and wins $2,500.